In this letter, John Papa ʻĪʻī writes to Amos and Juliette Cooke at the Chief’s Children’s School in Honolulu, informing them about things in Lahaina, where he and Dr. Judd are traveling with students from the school. John Papa ʻĪʻī began his service in the royal court when he served as an attendant to Liholiho, Kamehameha II. Īʻī later became a trusted advisor and chief in the court of Kauikeaouli, Kamehameha III and continued to serve the sovereigns of Hawaiʻi until his death in 1870. At the time of this letter, he is escorting the boys from the Chiefs’ Children’s School as they travel in Lahaina. Mr. Amos Starr Cooke was a missionary with the eighth company. He and his wife, Juliette Montague Cooke, ran the Chiefs’ Children’s School. 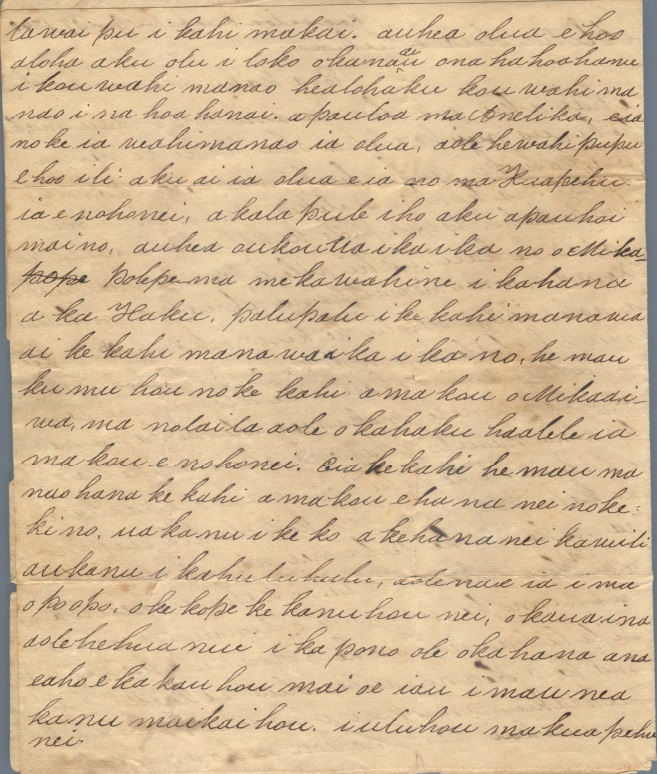 Sarai, the wife of John Papa ‘Ī‘ī at the time of this letter, assisted at the Chiefs’ Children’s School. “We miss you folks very much and pray to God on your behalf, to help you folks and us as well. Much affection to the two of you and the young girls”. • The evolution of a new and distinctive musical tradition (with harmony and choral singing). 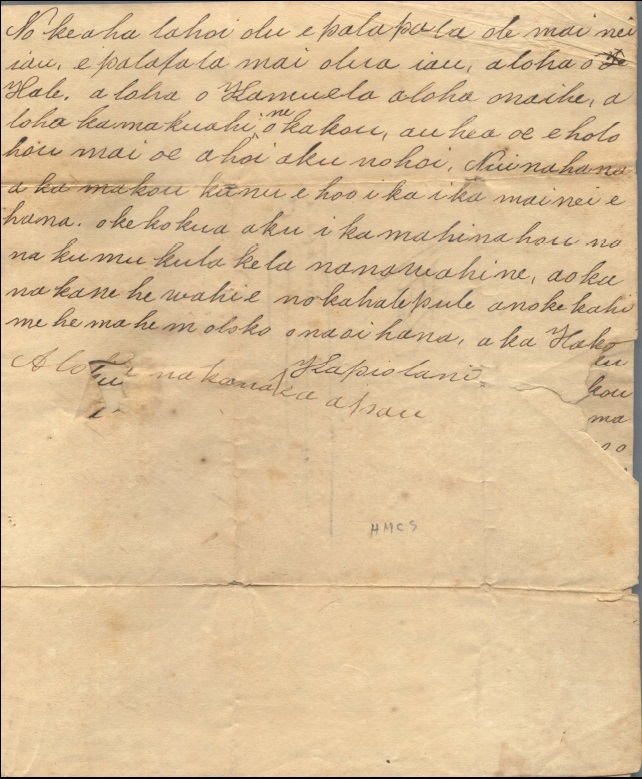 In this letter, John Papa ‘Ī‘ī writes to Mr. and Mrs. Amos Cooke to inform them of their arrival in Lahaina with the boys from the Chiefs’ Children’s School and tells of their activities there. In this letter, King Liholiho expresses gratitude to the American Board of Commissioners for Foreign Missions for sending the missionaries and introducing the word of God. He reports that his people are happy to have learned the word of God. The American Board of Commissioners for Foreign Missions (ABCFM) was a Christian organization that sent companies of missionaries to Hawaiʻi beginning in 1820. Liholiho, Kamehameha II, was the son of Kamehameha I. He inherited his father’s rule and was the sovereign of Hawaiʻi at the time of this letter. “We had wooden deities before, during my father’s time. In my time, I have abandoned wooden deities. It turns out my abandoning of them beforehand was appropriate, for Mr. Bingham, Mr. Thurston and all the teachers were arriving. Click HERE for a link to the original letter, its transcription, translation and annotation. 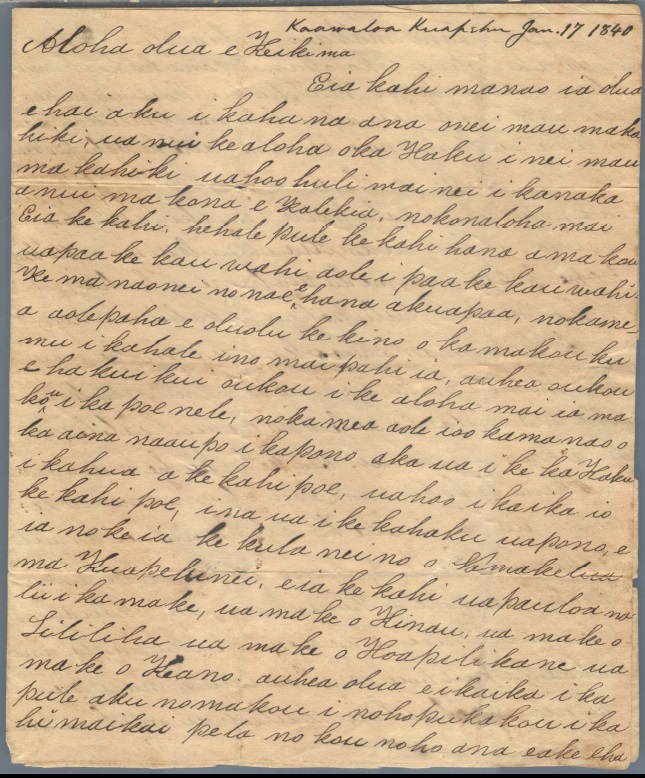 In this letter, Kapiʻolani writes to Reverend Samuel Ruggles and his wife about progress at Kuapehu, Hawaiʻi Island, and her wish for them to visit or write. The letter is addressed to Keiki ma. Keiki was an affectionate nickname given by the Hawaiians to Rev. Samuel Ruggles. “Keiki mā” refers to Samuel Ruggles and company, in this case, probably his wife, Nancy Wells Ruggles. “Say, you should sail here again and then return there. There are great efforts that our teacher is striving to do. In this letter, Gideon La‘anui writes to affirm that Mr. Loomis and all the missionaries are blameless and that he is devoted to Jesus and the word of Jehovah. Elisha Loomis was in the first missionary company in 1820 and became the first printer in Hawai‘i. Gideon Peleiōhōlani Laʻanui was a native of Waimea, Hawaiʻi who was partly raised in the court of Kamehameha I and married Nāmāhana, a sister of Kaʻahumanu. He was an early Christian convert and became an active member of the church, living in Waialua, Oʻahu.